Exhausted by the pavement pounding from our first night in Cuba and also the excitement of Sunday, on Day 2 (Monday) Luxy, Ciara, and I gave our sandal-clad (espadrilles for me) feet a break. 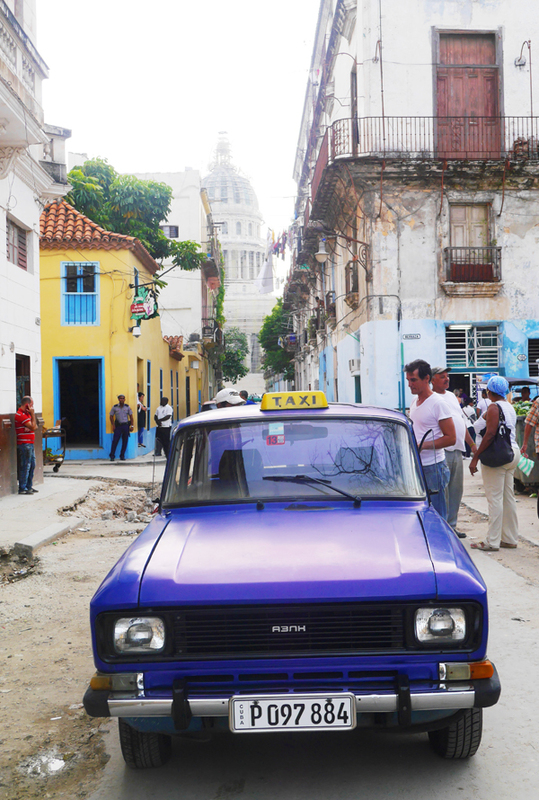 We opted for a more leisurely means of transport that meant we would see all the 'historically essential but a little boring' sights of Havana (ie. revolution buildings that look like council flats) while putting our feet up and enjoying the breeze in our face. 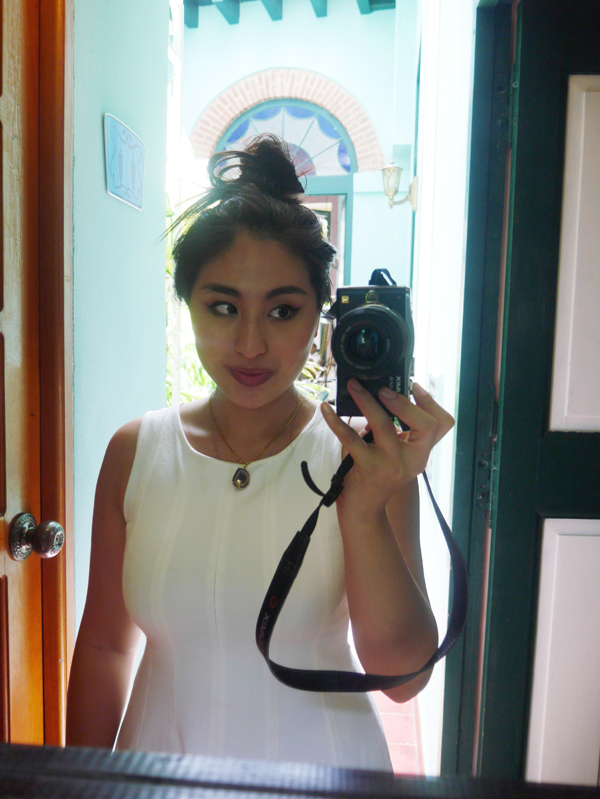 But first, we woke up early to a home-cooked breakfast at our B&B, Casa Cristo Colonial. 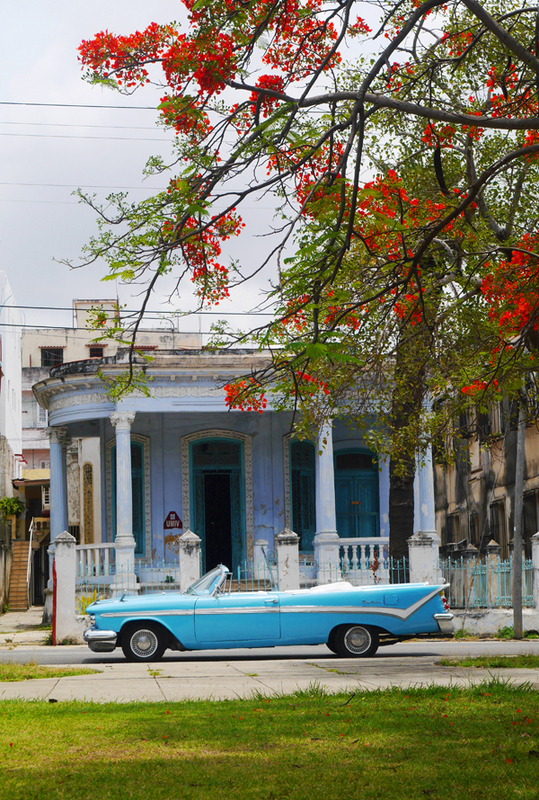 Staying in casas when in Havana is the way forward. 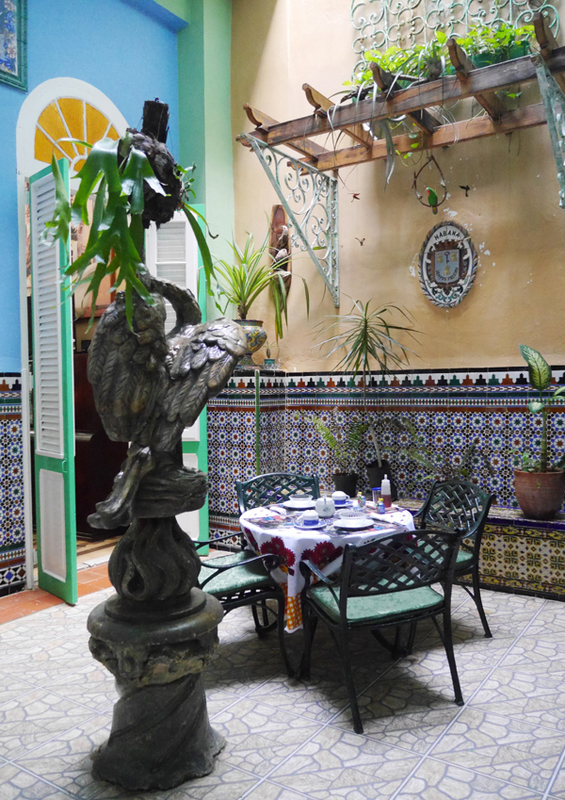 Casa Cristo Colonial (CCC) is a guesthouse in the heart of Old Havana, just minutes walking distance from the centre of the city. The colourful, beautifully decorated (a seriously trippy painting of a diver riding a seahorse hung above our beds) guesthouse is in the colonial style. Our hosts Belkis and Jevier were very helpful, friendly, gave us useful advice (especially regarding taxi fares and prices we should pay), and their little boy Kevin was so adorable that my ovaries imploded every time he babbled and pointed excitedly at whatever I was editing on my Macbook. Our lovely hosts Belkis and Javier with their adorable family. 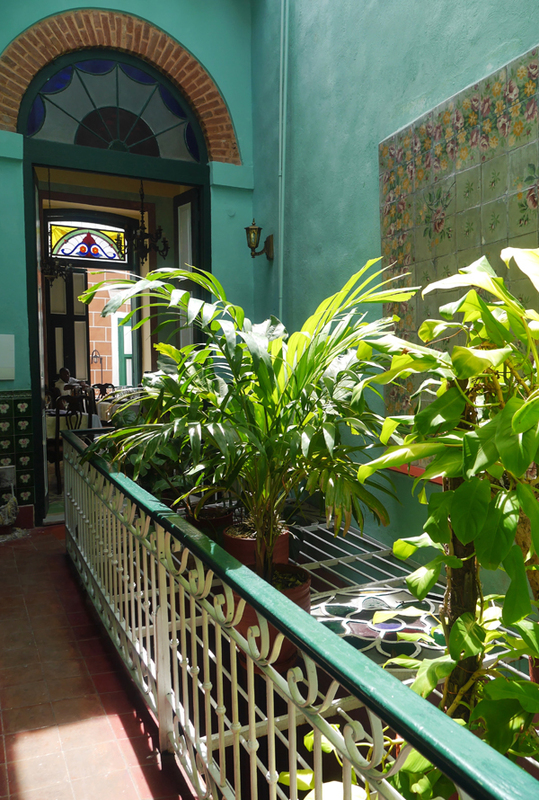 Aside from being smack bang in the middle of the city, staying at a casa meant that we got to practise our Spanish with locals, meet other travellers, and get an insight on Cuban life. 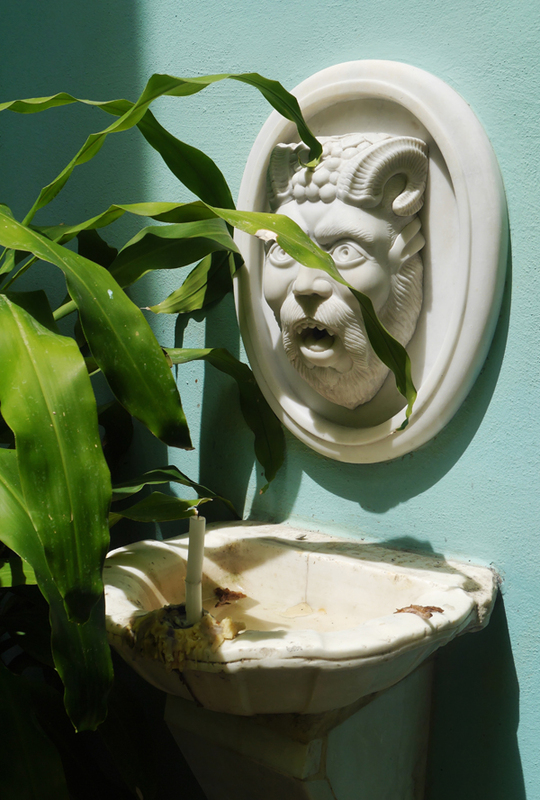 Another favourable aspect was that staying at the casa was very affordable, perfect for a Posh, Broke, & Bored intrepid gadabout like yours truly. Our stay at CCC cost us just 45 CUC (£35) per night for all 3 of us. That worked out to £35 each for our first 3 nights accommodation, compared to around £150 each for a hotel. We opted for breakfast which was only an additional 4 CUC (£2.50) a day. Do note though that the food that Cubans eat may be simpler and plainer than what they serve to guests, so if you want breakfast you inform them the day before. Breakfast is always fresh fruit; bananas, pineapples, papayas, eggs, slices of moist, dense, buttery cake, and the fluffiest, warm, buttery buns fresh from the bakery that gently sighed tiny breaths of steam when you pulled them apart to, you guessed it, butter them. Our drinks were thick, ice-cold, fruit juices (the guava was my favourite) followed by coffee or tea. 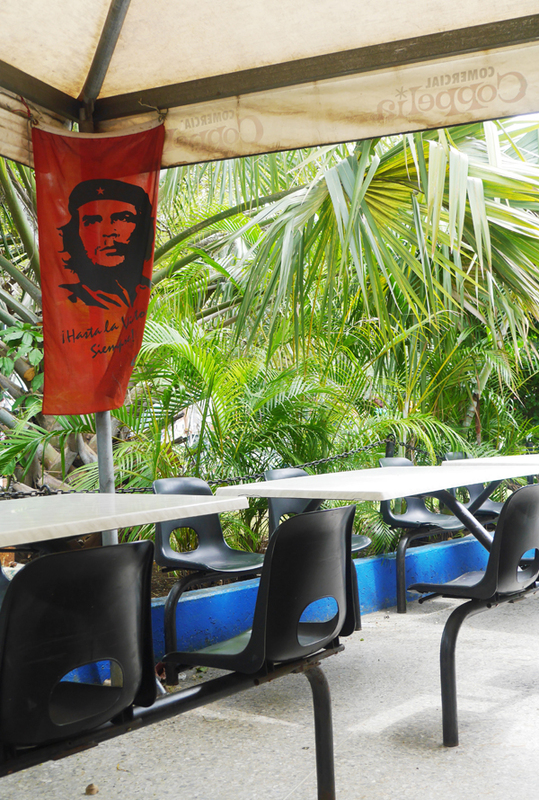 I daresay the breakfasts at CCC were much nicer than the ones we had at two hotels (one was a 4* resort in Cayo Largo, the other a 5* in Miramar) in Cuba. There's no better start to a day of sightseeing than to rise early, have a conversation with the locals in their language (although my Spanish leaves much to be desired. It's 'muy calor' (I'm hot) NOT 'muy caliente' (I'm horny) and fuel up with a huge, hearty, breakfast. It's not uncommon to see entire streets in Havana ripped up with exposed pipes surrounded by huge puddles and piles of dirt. When we first arrived at the casa our taxi had to take many detours to get around the roadworks. It's easier to dismiss it as an inconvenience of the embargo or incompetence but one realises that it's a similar sight in many parts of Soho or any big city in the world, really. I mastered the art of jumping around puddles, mud, and dusty piles of rubble but still my lacy canvas espadrilles went from cream-coloured to a sort of beige after a couple of days. 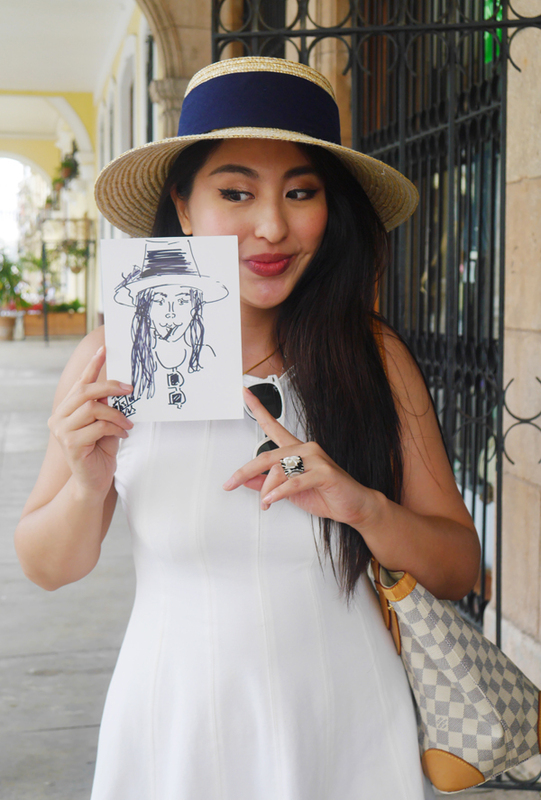 This street artist observed us contemplating a coconut ice-cream (served in half a coconut shell) and whipped up a quick caricature of me. 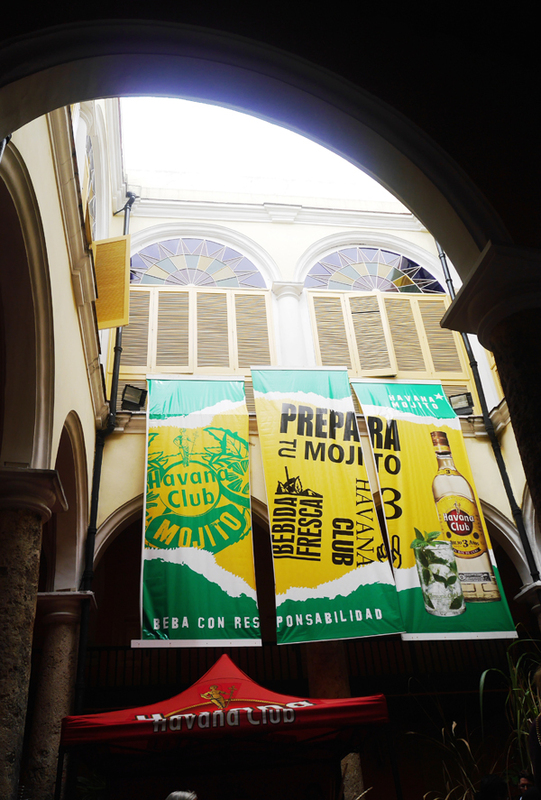 Our first destination of the day was the Havana Club rum museum. Here's an anecdote about an irritating promoter, the sort that give the rest a bad name. As usual many a promoter would strike up a conversation and walk a little way with us asking if we'd like to go the Buena Vista Social club. 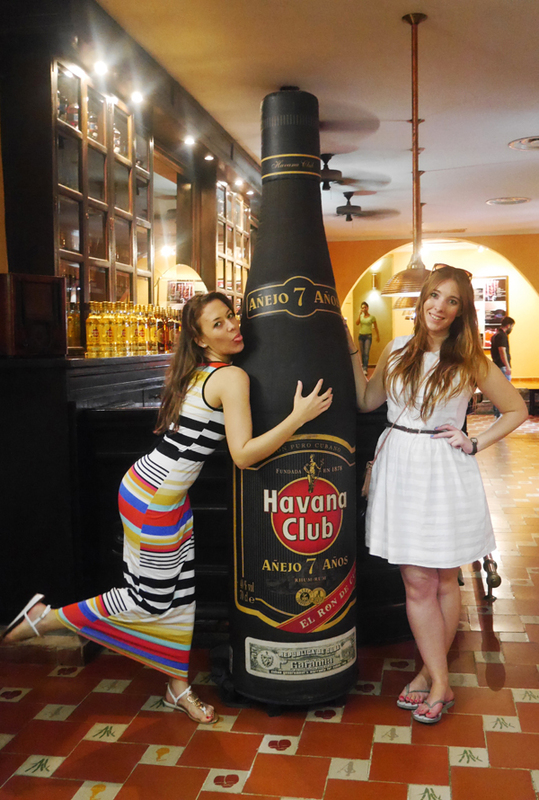 We politely declined (I have perfected my accent for 'no, gracias') and said we were on our way to the Havana Club rum museum. The promoter than lied and said, 'No, don't bother, it's closed today. 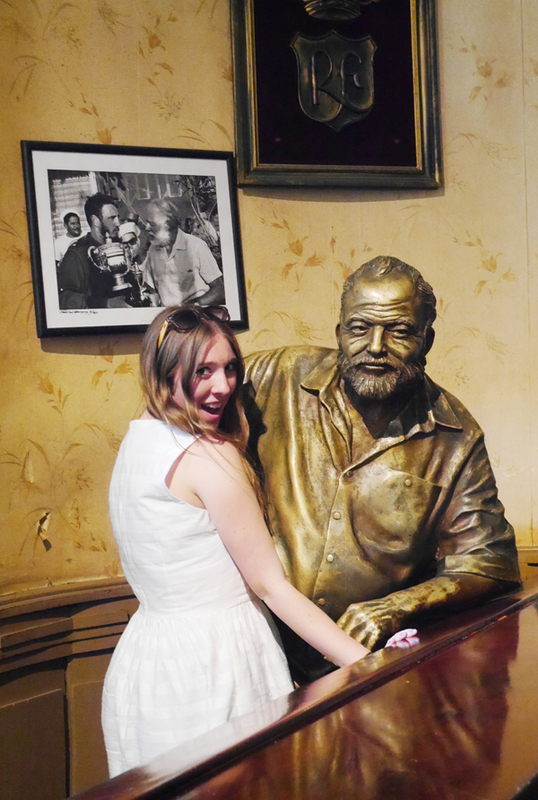 Come to Buena Vista Social club instead.' Despite our insisting that it was opened, that we had called to check, he persisted with 'I'm telling you, it's closed. I just walked past it. Come with us instead'. Boldfaced liar. Ciara said "I just knew he wasn't very nice. You can see that sort of thing in people's eyes." 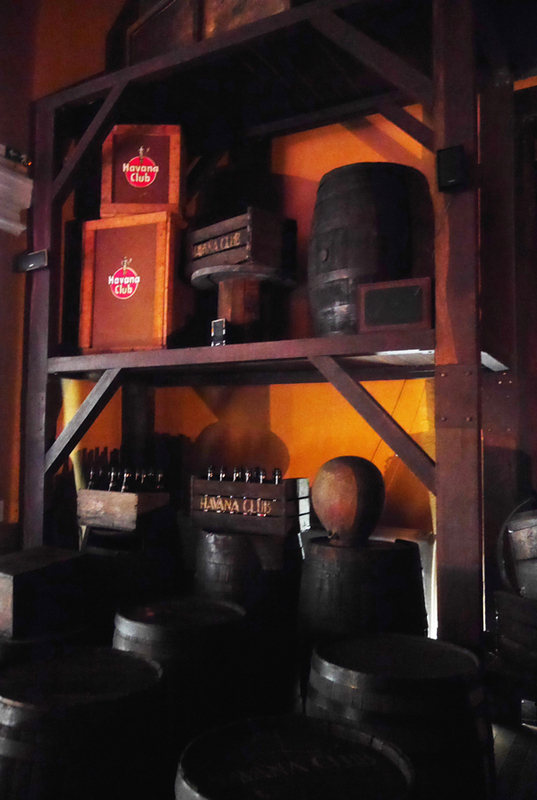 We got to the rum museum without any incident unless you count the many times my hat was blown off my head onto oncoming traffic and I nearly got killed running after it. 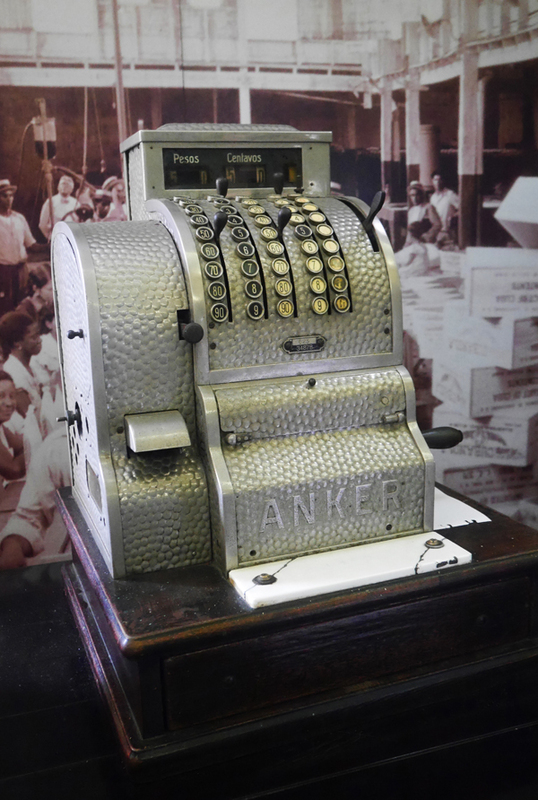 A typical bottle of Havana Club rum (white, dark, especial) costs only 5-8 CUC (!) but this fine specimen was a whooping 1,700 CUC. 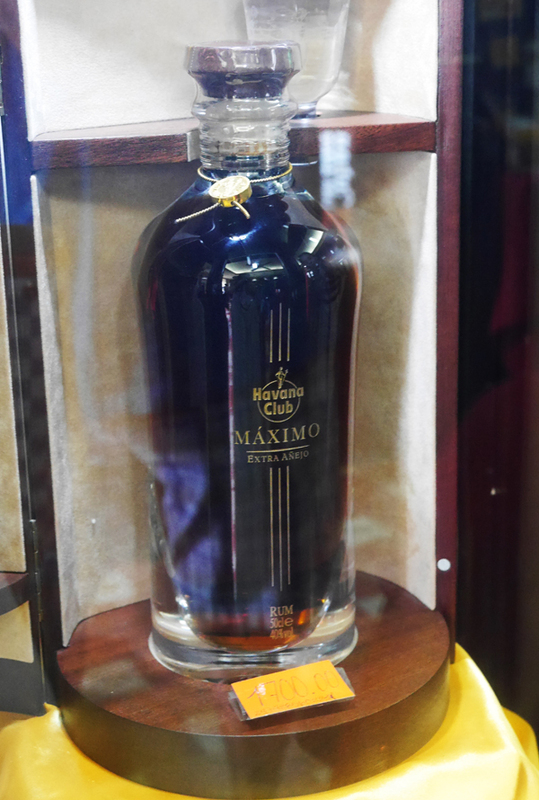 The Cristal of rum. Incidentally Cristal is the name of a Cuban beer which costs maybe only 1.5 CUC? Imagine the culture shock when a Cuban goes to, say, London, and orders 'one Cristal, please'. 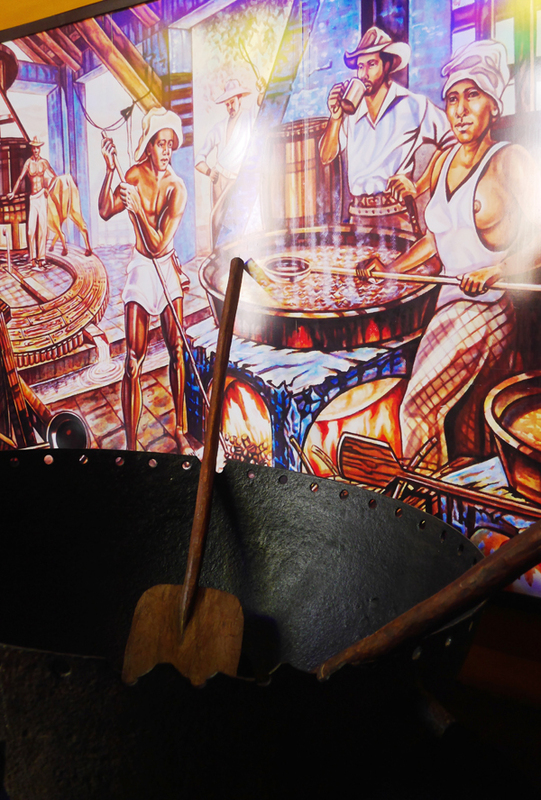 El Museo del Ron was less of a museum and more of a short tour on the history and production of rum in Cuba. Some found it disappointing as essentially it was just a walk around a train model, a vat of bubbling molasses that the museum leaves open to make the air fragrant, artwork depicting the role of slavery in the production of Cuban rum, a dark, dusty set design filled with barrels and different types of Havana Club showcased in glass on plinths before being led through to the bar for a shot of rum and then exit through the gift shop. Personally I didn't mind as I'm not especially passionate about rum. I do enjoy it but I am no connoisseur and certainly not bothered about being especially learned about it's history. 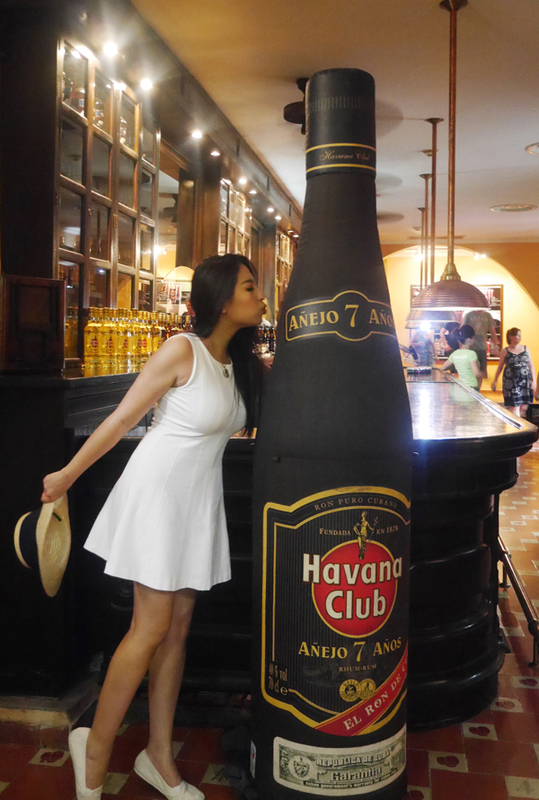 To me, it was a short, simple, and sweet glance at the history, production, and different kinds of Havana Club rum. My favourite parts of the tour were perusing the gift shop, the shot of rum at the end of the tour, and these recipes blown up in huge posters and plastered across the bar. These cocktails will be perfect for summer. 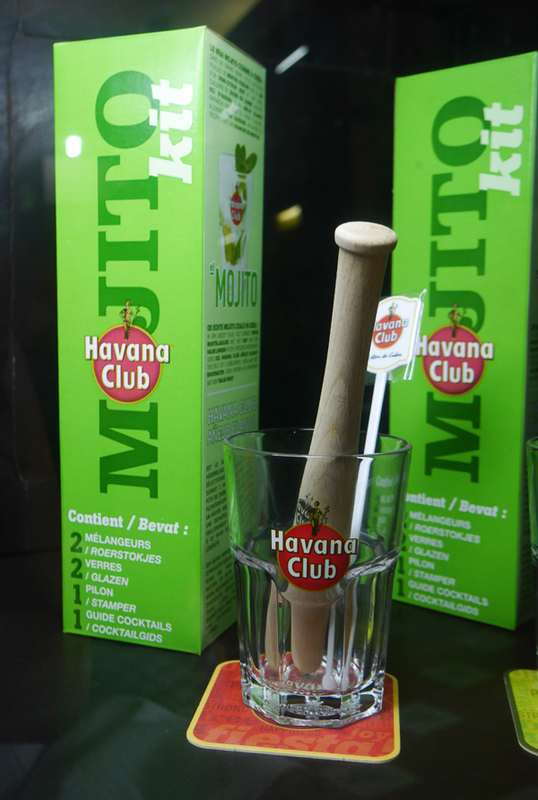 I impart these recipes to all who read this as my little present from Cuba. Go forth and mix! I bought two bottles of Havana Club Ritual. 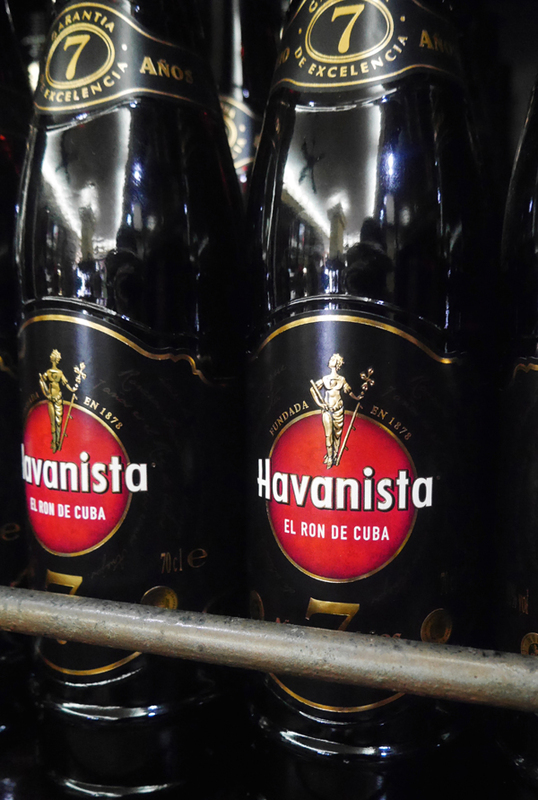 This dark rum with hints of vanilla is aimed at the Spanish market who tend to serve their dark rum with Coke. I like mixing my rum with Diet Coke and I do enjoy vanilla, so this was the perfect poison for me. Afterward we did the mandatory 'quick cursory glance at the landmarks' tour of the city. 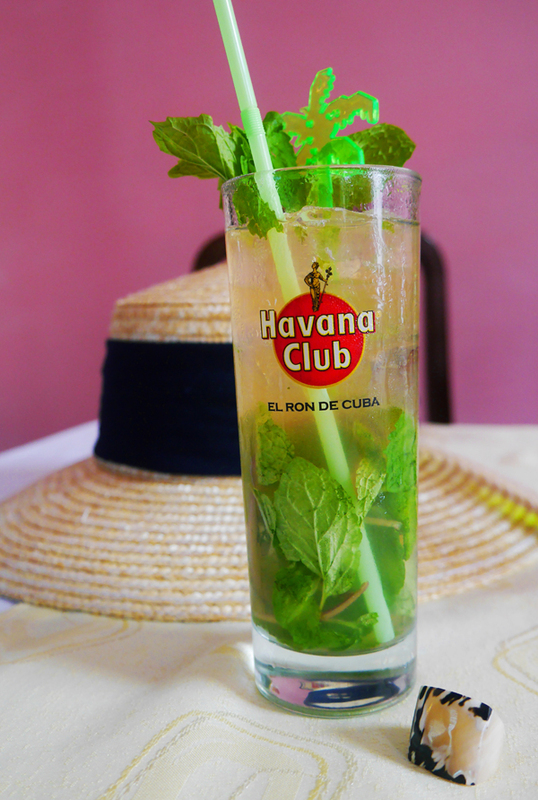 In Cuban style. For 20 CUC, a driver and his English speaking guide took us on an hour long tour in his 1959 DeSoto Firesweep. We drove through Chinatown, our guide explained 'No Chinese here! Only one Chinese, there!' and pointed at a Confucius quote painted on the side of a building, and along the Malecon seafront. Ministry of the Interior of Cuba building at the Plaza de la Revolución. It's a very unremarkable building that looks more like council flats and less like the stomping grounds of the higher ups. It's good to see them practising what they preach, I could never take seriously a Communist leader living in a gilded hall of mirrors of gold. I won't lie, we were much more interested in posing with our ride than taking a closer look at these monuments. 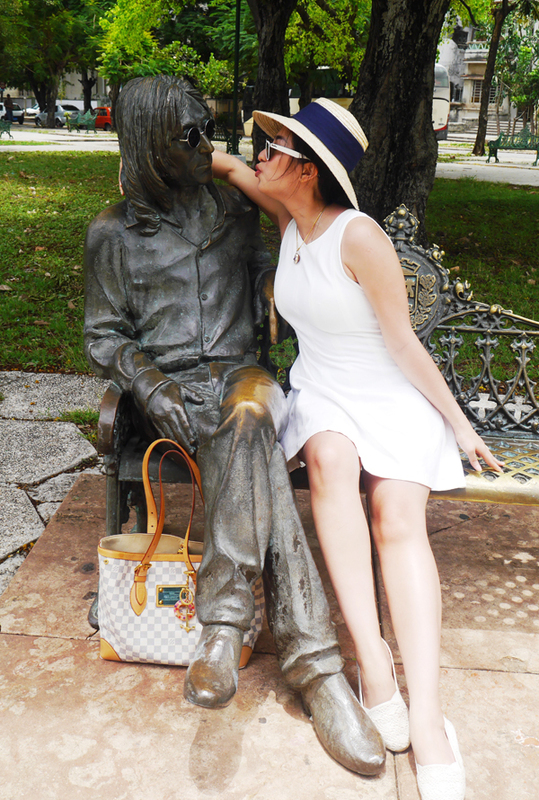 We drove through the district of Vedado to visit John Lennon's state in Parque John Lennon. Our guide told us that The Beatles used to be banned in Cuba and Cubans would furtively listen to them on pirate or Mexican radio stations in secrecy for fear of being caught. 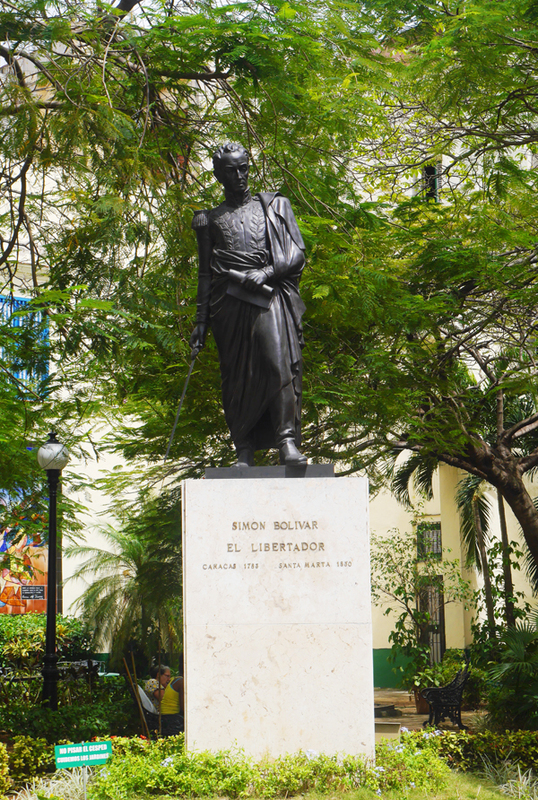 When the ban was lifted, he openly (and rightly so) became an icon in Cuba. 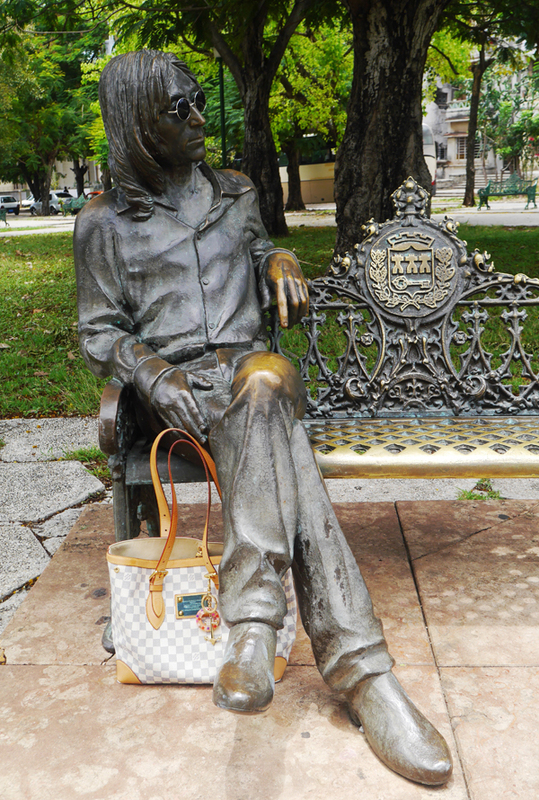 A statue of John Lennon by Cuban artist José Villa Soberón sits on a bench, looking ever so pensive in Parque John Lennon (formerly known as Parque Menocal). Mostly he looks more bewildered then pensive. And I imagine more than irritated by the many thief's and vandals who have stolen or destroyed his signature glasses. When we visited he was wearing a bog standard pair that still had their UV labels on, apparently a security guard will put them on the statue if requested. The inscription on the marble slab at the foot of his bench is a Spanish translation of the lyrics from 'Imagine'. Dirás que soy un soñador pero no soy el único" / "You may say I'm a dreamer, but I'm not the only one". 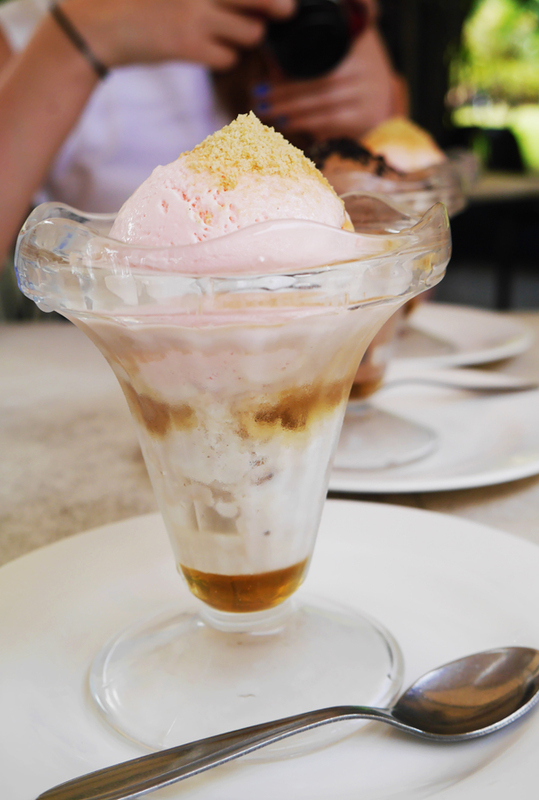 Hot and sweaty, we ended our tour and asked our men to drop us off at Coppelia for ice-cream. Hyped up as the biggest ice-cream parlour in the world and featured in the classic Cuban movie about LGBT persecution in Cuba 'Fresa y Chocolate' (Strawberry and Chocolate), our expectations for Heladeria Coppelia were as big as the building itself. But it was closed that day! Like a child whose ice-cream falls from his cone and splatters sadly across the road like a bird fallen from the sky (true story, happened to me when I was seven, in Rome. Mint chocolate chip, in case you were wondering) our ice-cream dreams were dashed. Only a small booth at Coppelia was open, and the flavours available that day were strawberry, chocolate, and vanilla. What. That is essentially one flavour, have you heard of Nepoalitan? The ice-cream we bought on the streets for 3 pesos (mango! orange and pineapple! coconut) were so much tastier, with much more exciting flavours too. 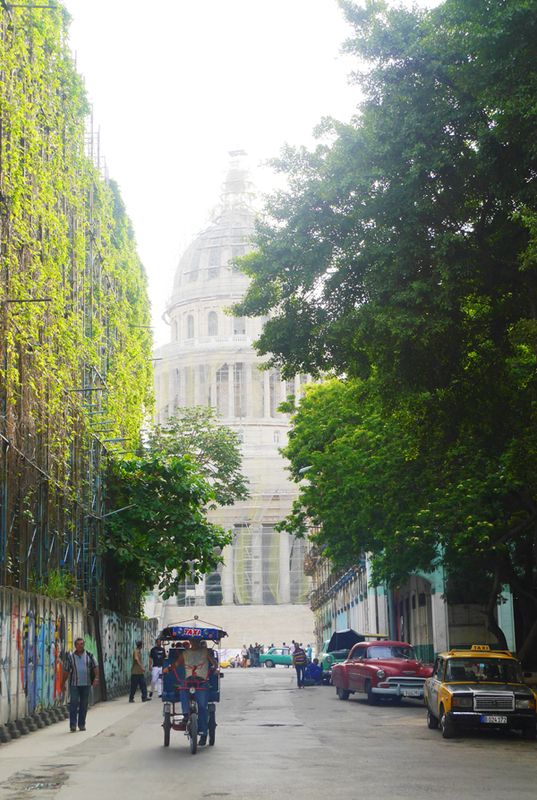 We tried to redeem ourselves and so we clambered into a rickety taxi with no seat belts back into Old Havana in pursuit of lunch. 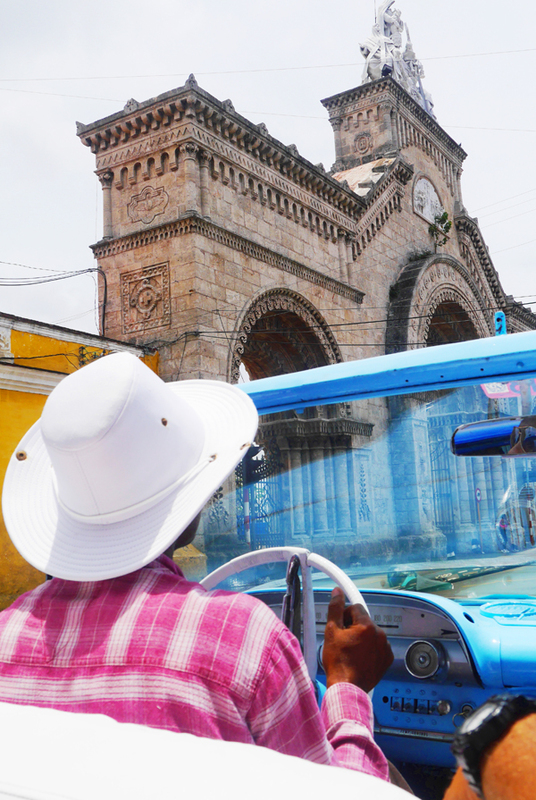 Our taxi dropped us off just outside the cobblestone square of Plaza De Armas. A browser's heaven, the square is surrounded by a market. Wooden stands, shelves, and tables heaved with old books, vintage Magazines, posters, military pins and badges, all sorts of paraphernalia bearing Che Guevara's face, medals, cigar labels...it's basically a collector and vintage lover's dream. I was browsing the books and the very helpful trader asked me what I was looking for. I innocently asked "Where can I get military uniforms?" "You know, tunics, coats, hats, medals...I collect that sort of thing!" Just before I left for Havana Henry gifted me an RAF jacket and cap. He advised me against wearing it to Cuba when usually we would both dress up in full uniform just to go out and buy eggs. The stallholder seemed a little surprised but beckoned me round to the side and showed me some war and military medals. I chose one for 'special services' and also picked up a few pins. As a gift he gave me the 3 peso note with Señor Che's face on it. 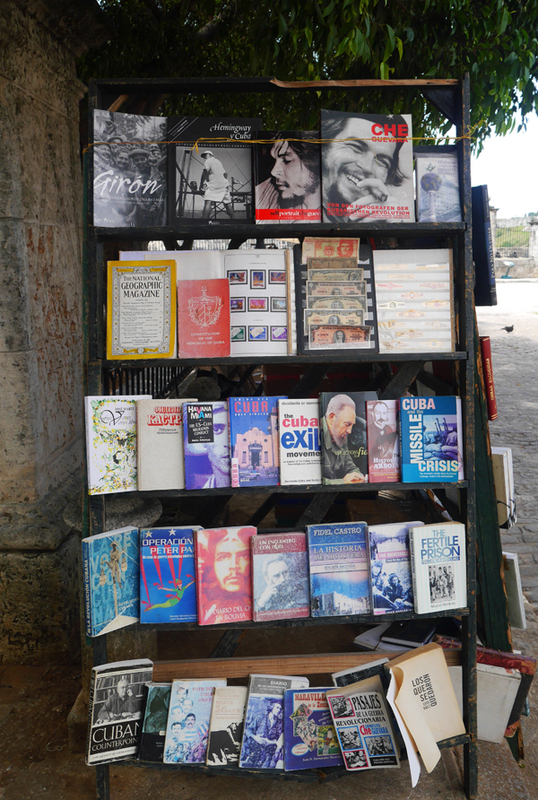 Also, Ciara insist that Che Guevara looks like Brad Pitt. Now I can't unsee it. Che Pitt? Brad Guevara? And Fidel Castro is a dead ringer for Liam Neeson. I've now decided that I fancy the pants off Che Guevara. The girls were on a mad hunt for this three peso note (none of the banks or shops would take our CUC and give us change in pesos, but eventually two nice men swapped them for it) and I got gifted one just for being a bit of a military fetishist. Score! Does this make me a war profiteer? My not-so-but-will-soon-be-shiny new babies. Henry is very jealous. You may kiss my medal, peon! 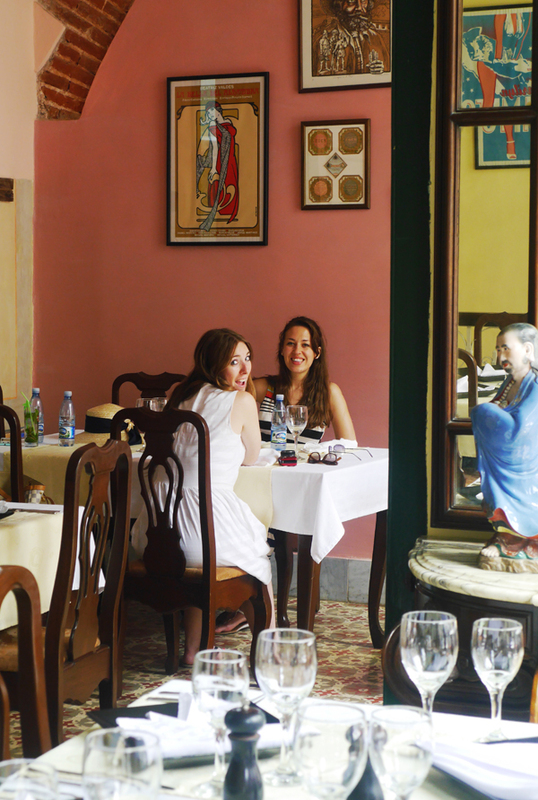 We resume the hunt for our must-go lunch destination, Paladar Los Mercaderes. 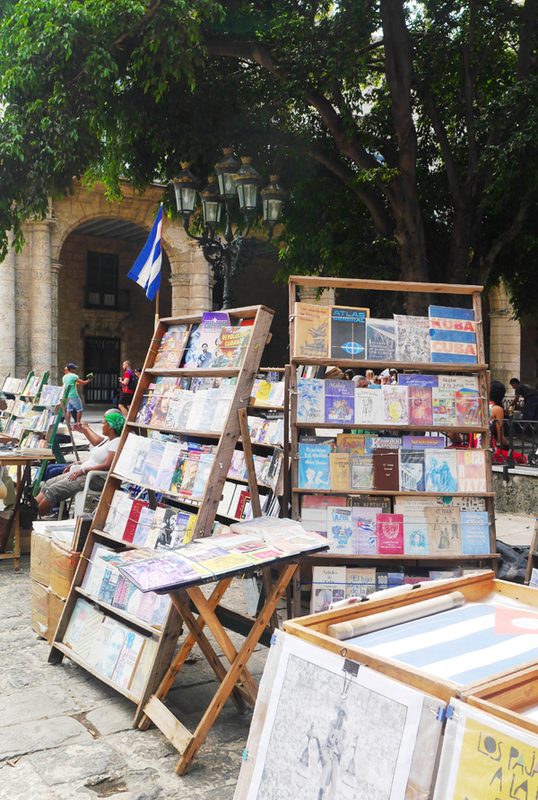 Cigars are sold on the same counters as drinks and ice-cream on the streets of Havana. At last, the promised land, Paladar Los Mercaderes. Our first impression was that it was very 'airy', that the high ceilings and tall windows lent the place a brightness and light breeze which was a very welcome respite from the scorching tropical heat outside. My two starters, fish tartare (5 CUC) and lobster spaghetti (9 CUC, I think) so large it was practically a main. I could barely finish it and by the end of the meal we were all slipping into food comas! The heat and the rich food got to Luxy and I. 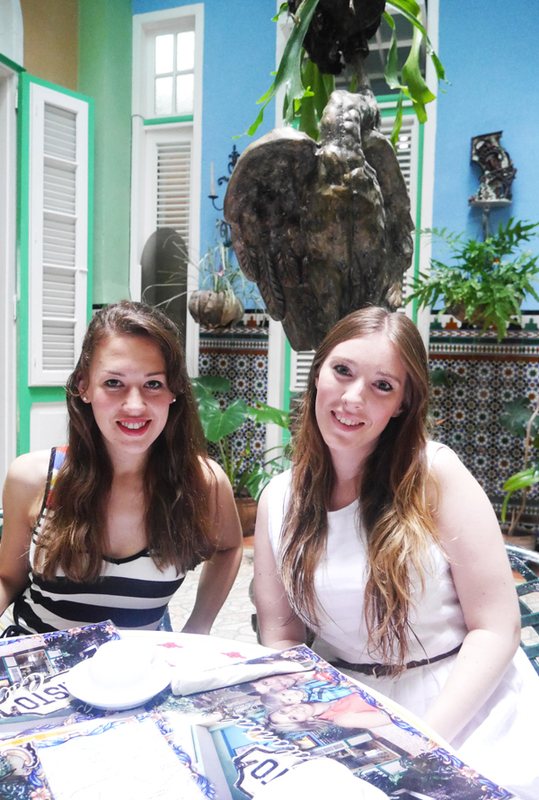 The best food we've had in Cuba! It was so good that we came back on our last day. 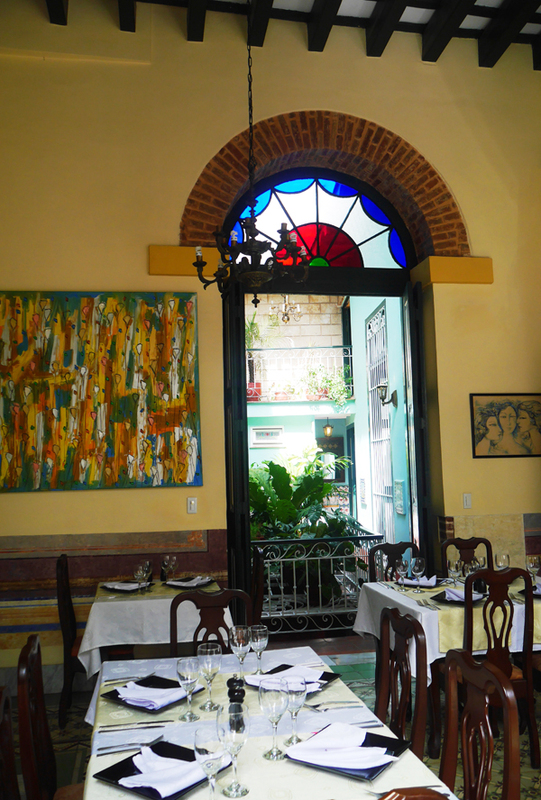 We had planned (and failed, twice) to have lunch at San Cristobal but we didn't even care. I would definitely, wholeheartedly recommend Paladar Los Mercaderes. Try the lobster in secret pineapple sauce! The food is wonderful, the staff are so helpful, friendly, and chatty (in the best way possible), the ambience and decor is beautiful. We had a very early start the next day because we had to wake up at four in the morning to catch our flight to Cayo Largo Del Sur, so we skipped dinner and ended our evening early with cocktails. The evening before we visited Ernest Hemmingway's favourite mojito bar La Bodeguita del Medio so it seemed only appropriate that we went to Floridita, home of his favourite daiquiri. Hemmingway giving us serious side eye. Our wonderful barman. 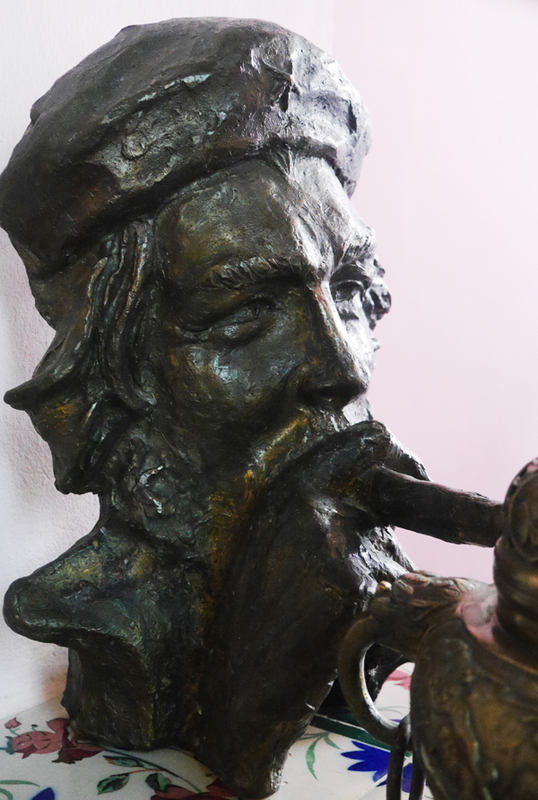 We asked him how the ice in the daiquiri was processed in the days before blenders. He whipped out a napkin and pen, carefully drew a saw, and explained to us how blocks of ice would be sawn to produce the finely shaved ice that is essential to the perfect daiquiri. Oh, the diligence of those ice artists! 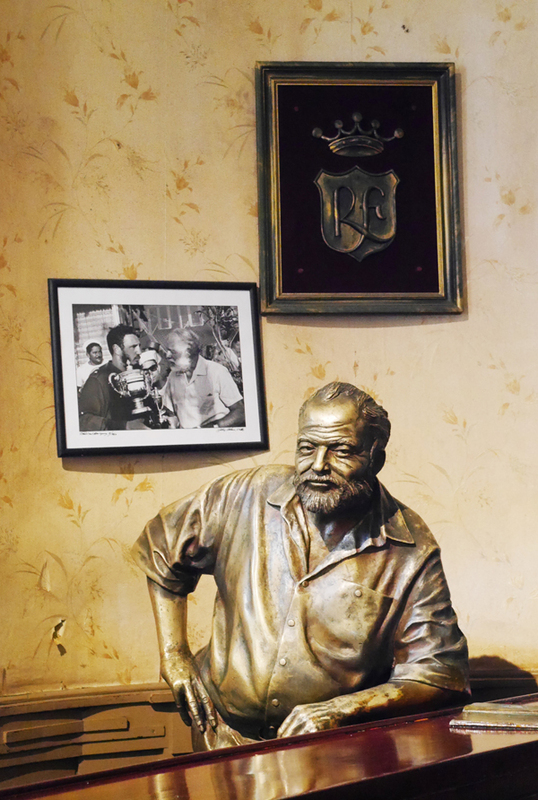 Their spirit lives on in our barman, in his meticulous attention to detail and respect and love for his work. The daiquiris were glorious too. 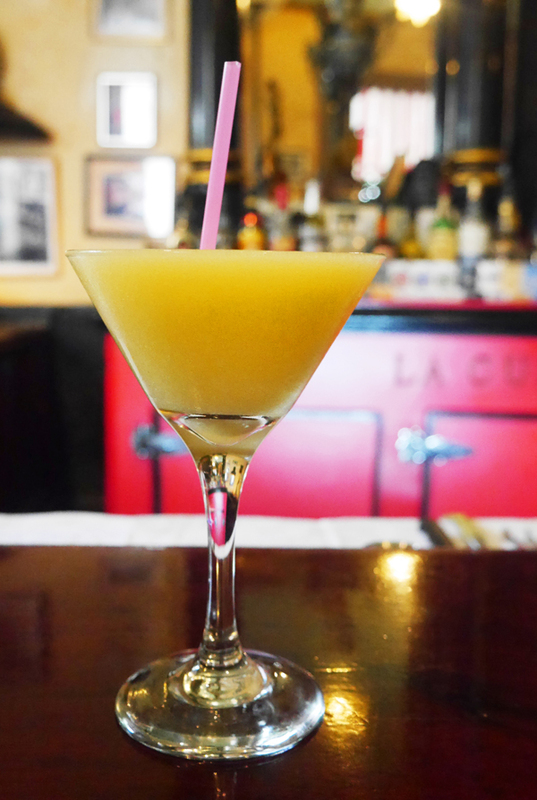 I had a mango daiquiri which went down well...perhaps a little too well. 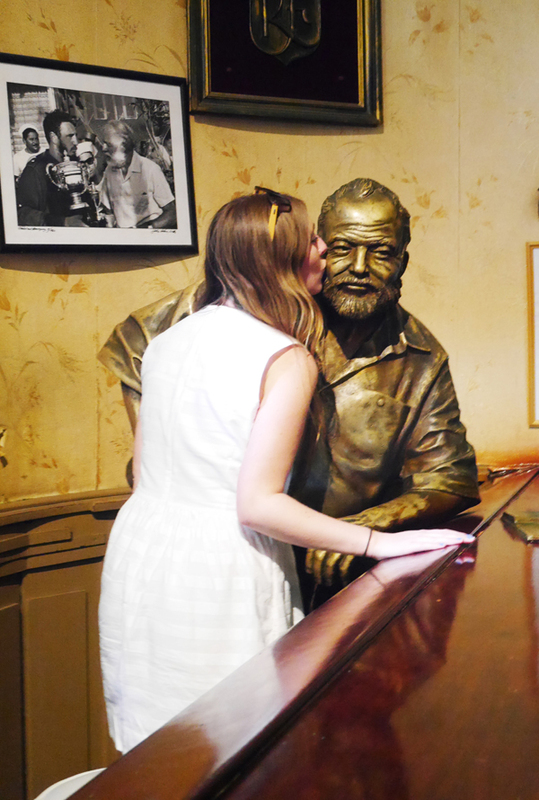 My love for Hemmingway is Ernest. The combination of the Cuban heat, the delicious (and heavy) late lunch at Paladar Los Mercaderes, and the daiquiris at Floridita sent me to a very happy place. We called it a day, returned to the casa, packed our bags for a very early flight to paradise, and went to bed at eight like schoolchildren. For we had to be bright and bushy tailed for Cayo Largo Del Sur! 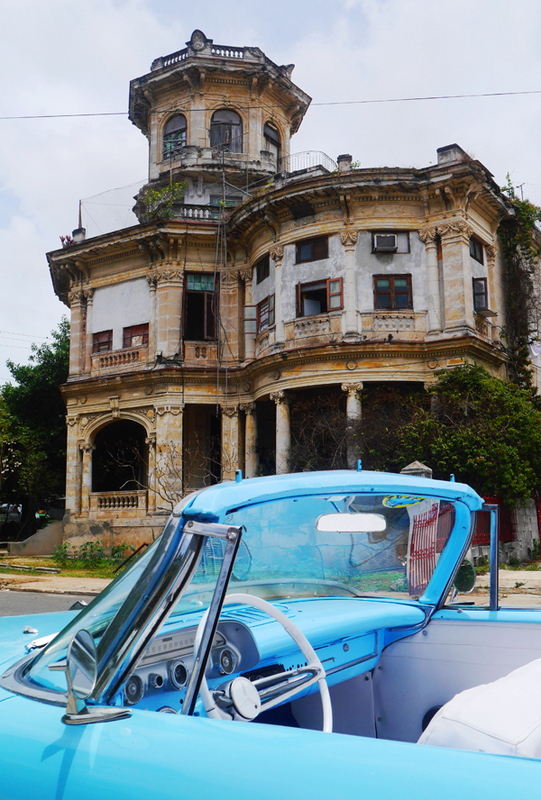 Not to fear, we would return to Havana for a night and a day after. But for now...paradise beckons! I really enjoyed this post! And I think Che looks more Johnny Depp than Brad Pitt! Cuba sounds and looks incredible! I just wondered where you got your hat from? It's so pretty.